This year is Newlon’s 50th anniversary and to celebrate we held our second ever Newlon Star Awards. The awards recognise the achievements of those residents who have been involved in improving services, supporting fellow residents and contributing to the communities where they live. They showcase what can be achieved through being involved and working together. 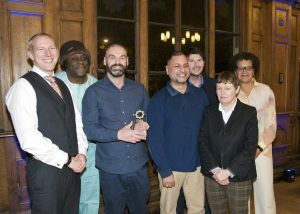 A ceremony and dinner were held at Tottenham Town Hall on 23rd November where the winners were presented with their awards. The event was hosted by the BBC radio presenter Dotun Adebayo and Newlon’s Chair, Sarah Ebanja. 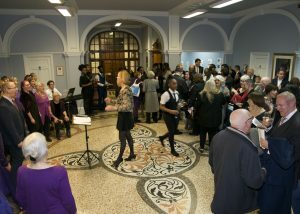 Guests enjoyed a meal and live entertainment, including a performance by the Tottenham Community Choir. Big congratulations to everyone who was nominated and a thank you to those who took the time to nominate their fellow residents. We received double the nominations from the last time we held the awards, so anyone who was nominated or shortlisted will have received significant support for their contribution to their local community or improving the way Newlon works with residents. We hope the awards demonstrated the appreciation of fellow residents and Newlon staﬀ members towards those who have shown such dedication. If you want to get involved with Newlon then find out more in the get involved section of the website.